Closed captioning for this video is available on YouTube: A Set Of iOS Shortcuts To Manage Text Clips. So let's take a look at building an iOS shortcut that's actually a series of shortcuts because sometimes you need to have one to do one action and one to do another that matches it. So for this example what we're going to do is create kind of a clipboard manager. A way for you to save bits of text and then call them back later on. So instead of just being able to Copy and Paste you can actually Copy and Save these different things. We're going to actually create three shortcuts to do it. The first one is going to save a clipboard . So whatever you've selected and copied and it's going to save it to a file. So I've called that, it's at bottom left here, called Save Clipboard to Clips. So I'm just calling this Clips. I'm going to look at it right now and it's basically just three short actions. The first thing it's going to do is it's going to ask for input. It's going to get the name. So it's asking just give this clip a name. So you assign a name to this clip so you can get it back later. Now it's not really going to do anything there special. It's going to ask for input as text and no default answer. Then it's going to get the clipboard. So that's another action that we've dragged over. It's going to pass that into Save File. Now in Save a File here I've selected the Service as iCloud Drive. I've turned off Ask Where to Save. That's on by default and I've turned that off. I've set the Destination Path to Shortcuts/Clips, and I've typed in Clips, and then slash and then the input from Ask for input. So if I click on that there you can see there's a way to get the Ask for Input here and that then can be put in there. So I don't have have to save the input into a variable and then call it back or anything. I can just basically grab that. It's a magic variable. So that's all it's going to do. When I use that it should save whatever I have on the clipboard there. So let's go and look at that as an example. What I'm going to do here is I'm going to go onto the web and here I've got some text. I'm going to select the text. I'm going to Copy it. Then I'm going to return to shortcuts. I could add this as an icon on, you know, the main Home screen or whatever I want to do. But I'm just going to access it in here for now. So I hit Save Clipboard to Clips and it's going to ask for a name. So I'll call it Part 1 just as an example name. That saves it. 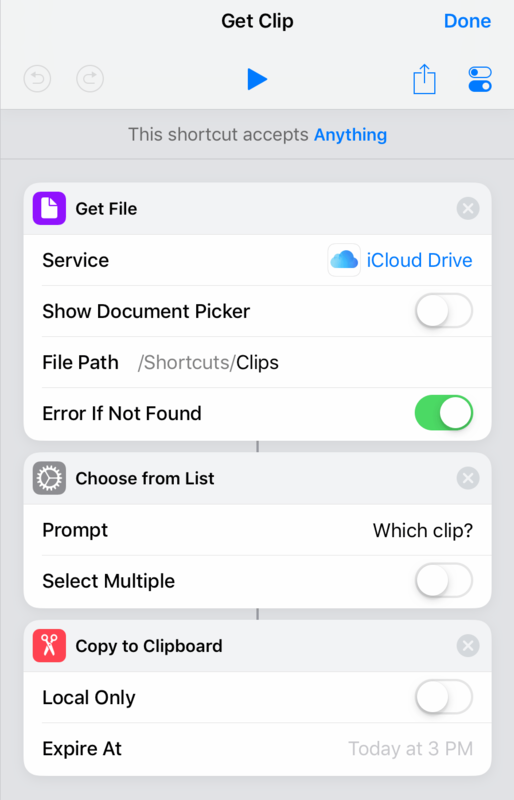 Now if I go to the Files app and I look in iCloud Drive under Shortcuts I have a folder called Clips there and there is Part 1. I can actually even look at it and you can see. So it saved it there. Now the second part of this is another way to save clips because sometimes you don't want to just save to clipboard. You actually want to save the selection. You don't have that available everywhere. In other words you can't select something say in Pages and then say Share It. You have to Copy it. So this is where you would use Save Clipboard to Clips. Save Selection to Clips is similar. It's going to ask for input just like before but it's going to Get Variable and instead of something else instead of the clipboard it's going to Get Variable and you can see Shortcut Input is what I've selected there. So you can see Select Magic Variable and I could say I want Shortcut Input as the magic variable. That's basically going to take the input rather than the clipboard and it's going to save it in the same way. So now I can return to Safari here. I will select a second paragraph here and I will do that but instead of saying Copy I will hit Share and then I hit Shortcuts and then I'll say Save Selection to Clips. Give this clip a name. Call it Part 2. So now we look in Files. Under files we can see we have Part 1 and Part 2. Great. Now back in Shortcuts note that in Save Clipboard to Clips, under the Settings here I've set it to Show in Widget and I guess I probably don't even really need it anywhere else. But I can put it to Add To Home Screen. That would be useful. But with Save Selection to Clips I've set it to not show in widget, because I don't need it there. Where I want it is Show in Share Sheet so when I hit Share it shows up. So two different ways to access to very different types of clips. Now Get Clip. What's Get Clip going to do? It's going to allow us to recall what's there. There's no easy way to do that. It would be great to be able to grab it and then automatically paste it in. But we're going to have to run that either as something on Home Screen or just go into Shortcuts here. So it's going to Get File and it's going to give the path there. You can see the path for Shortcut Clips. So I turned off Show Document Picker and I put that there. Then just put the Choose from List and the prompt there says Which Clip? Then it's going to then say Copy to Clipboard and it's going to just copy to the clipboard. So now what I can do here is I can run Get Clip and you can see it finds the files that are in that directory. So I never have to access that directory in the Files app. We are looking at it here to see those things appear. But now that I've got this running I can just ignore that folder. It's just a little storage area. I can say well let's get Part 1 and now that I've got Part 1 I can go and paste that anywhere I want. So, for instance, I could run Pages and then Paste and that's in there. I can go over and go to Shortcuts again, get a clip, let's get Part 2 now, and Page I can now Paste that. So now I have a way to quickly save these things and recall them. I don't really have to build too much of a management tool because I can always just go into Files and then go into this Clips folder here. I can just manage these as files, right. If I select these and Delete them or I could rename them or whatever I want to do. I can manage that all in the Files app. It's probably not going to get any easier than that. So I'll just leave that there and I've got a nice little utility there in three shortcuts. The first ran once and won’t again. The second and third fail to run at all with the error “the file Clips couldn’t be opened because there is no such file”. All 3 shortcuts are exactly as you present them. Max: Do you have a Clips folder in iCloud Drive? Does it contain the file created by the first shortcut? Gary, this procedures seems more complicated, and less useful, than using CloudClip Manager (available in the App store, supplied by Thinkbitz Software Studio). I have had this on my Macbooks for years, and probably it was you who told me about it! Dave: Yes, but for those that want to learn how to use Shortcuts, this is useful even if you have some other method. 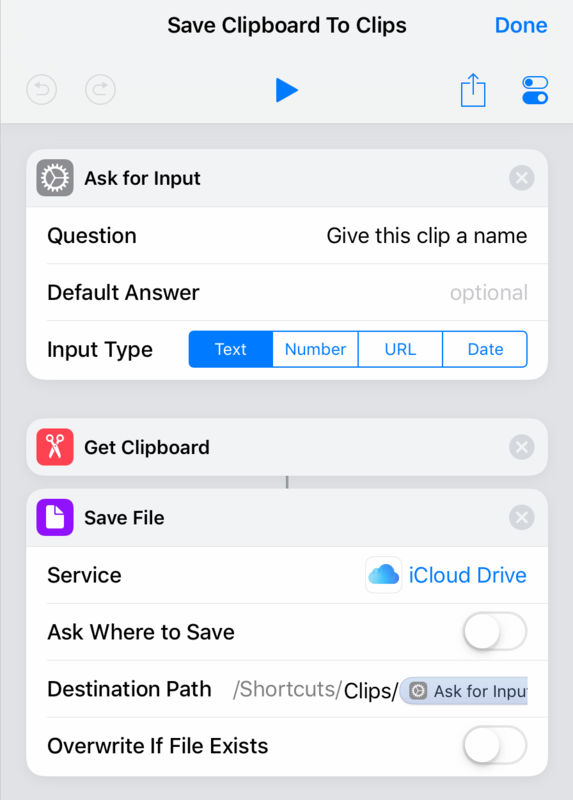 Cannot find “Save Clipboard to Clips” action in the Shortcuts Gallery. Rick: That is the name of the Shortcut we are creating in the tutorial. It isn’t there until you create it. Hi Gary, this looks very useful, apart from I can’t get it to work. I followed your instructions for the first one but when I go to save I get this error: The file doesn’t exist. The file Clips.rtf doesn’t exist. I’m not sure where I have gone wrong. Robert: Are you using the same thing I am for the Destination Path? Should be /Shortcuts/Clips/(Ask for Input) with that last part selected as a Magic Variable like I show. I added large images you can view just below the video above, so you can see the shortcuts more clearly. Gary: thanks for the reply. Yes, I have a Clips folder and it contains the first created item but no successive “saves”. Any ideas? Max: Sorry, no idea what could be wrong. Just check and re-check the Shortcut. Maybe start it from scratch. 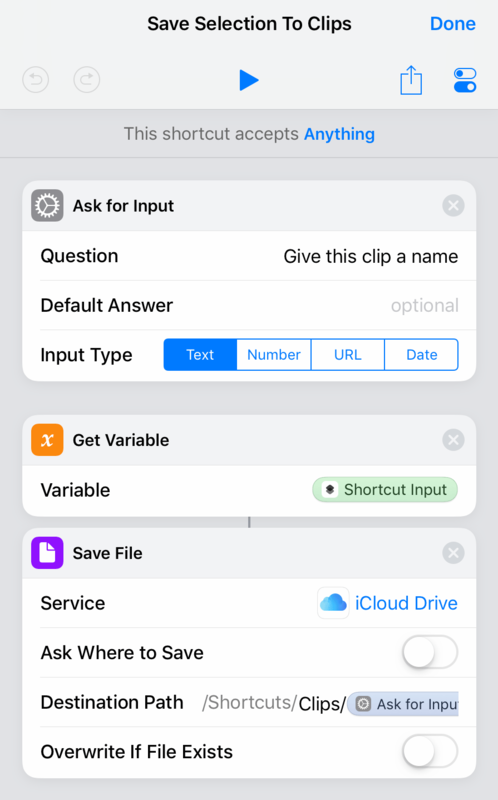 Leave a New Comment Related to "A Set Of iOS Shortcuts To Manage Text Clips"